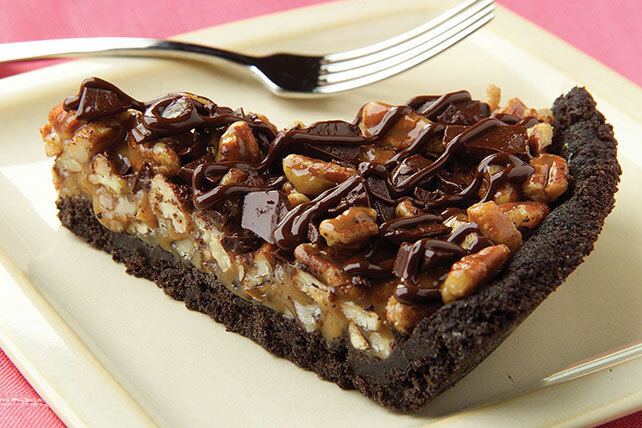 Make the most scrumptious pie ever with our Chocolate Chunk-Caramel Pie! Prep time for this delicious chocolate chunk-caramel pie recipe is just 25 minutes. It'll be time for dessert before you know it! Mix cookie crumbs and margarine; press onto bottom and up side of 9-inch pie plate. Bake 10 min. ; cool. Microwave caramels and half-and-half in medium microwaveable bowl on HIGH 3 min. or until caramels are completely melted, stirring after 1-1/2 min. Stir in nuts; spread onto bottom of crust. Refrigerate 10 min. or until set. Chop 2 oz. chocolate; sprinkle over caramel layer in crust. Microwave remaining chocolate in separate microwaveable bowl 30 sec. ; stir until completely melted. Drizzle over pie. Refrigerate 1 hour or until chocolate is firm. Balance choices throughout the day to enjoy a slice of this pie for a special dessert. Prepare using 1 cup KRAFT Caramel Bits. Spread nuts in single layer on baking sheet. Bake at 350°F for 5 to 7 min. or until lightly toasted.